Please Click above for larger Picture. We’re trying to decide if wearing this apron will turn you into Donna Reed or any of the other TV mothers from the 1950’s. We do know that it will make you queen (or king) of the kitchen, and provide up to the minute retro style. The scalloped hem and pocket bow details add that great vintage touch and the 100% lightweight cotton fabric is so easy to keep clean. Adjustable ties at waist and neck. 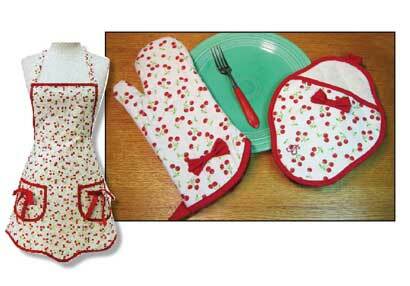 Matching oven mitt and pot mitt, made of heavyweight cotton twill, will keep you safe from the heat.